In flight security, management of air rage and threat assessment are provided by our team of experienced, qualified Passenger & Crew Protection Officers. Training of airline and airport staff and operational duties are undertaken by our team of Police and Military Dan graded black belt instructors. All personnel supplied will hold the BTEC Advanced Certificate in Passenger & Crew Protection qualification and have a proven police or military service history. PATRiOT has introduced the first nationally recognised qualification Passenger & Crew Protection Officer BTEC Advanced Diploma. Courses are carried out at the aviation training facility in Essex and residential training school in Kent. A bespoke training package was designed and approved by the FCO and Singapore government. 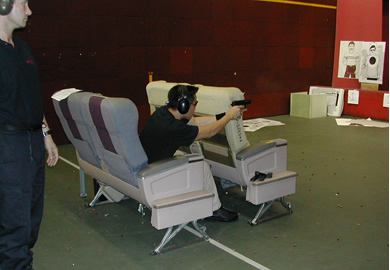 This unique training package was provided for specially selected members of the Singapore Police services.